Since September 2015, the Vinnova-funded project ”Shared energy double the force” has been working to ease the establishment and stimulate circular processes. To gain a better understanding of the project, we have developed a short film to demonstrate how we work with urban and industrial symbiosis in Malmö. We want to use industrial symbiosis as a way of working for urban planning processes and business development on a large scale. We see potential in the development and realization of recycling solutions in industries with the aim of creating attractive sustainable cities. We want to use the knowledge and the network created to include more flows in the city but also continue the process of creating a model for resource-efficient and circular economy, scalable in other regions and countries. The dissemination and commercialization of innovative solutions will be a central part of the project. The harbour area is the heart of the city’s energy production and waste management, and it has a well-developed infrastructure for electricity, heat and gas, as well as for waste water treatment. The port area also handles large flows of material and products, transported by sea or land, and in the area there are companies that sort, treat and store most waste fractions. The Malmö Harbour area is a huge area under development which contains two distinct parts – the northern part which includes the port and industrial harbor, and the southern part, known as Nyhamnen, which is planned to be both a residential and commercial (offices) area. The expanding of the northern part of the harbour opens up the possibility to develop the port area in a sustainable way, while contributing to increased competitiveness and profitability. A new area of approximately 450 000 m2 is to be established which makes room for several new industries and other businesses. 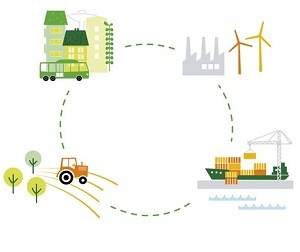 The City of Malmö has the ambition to develop this area as a front runner within the development of sustainable industry and port businesses and as an attractive spot for modern clean tech businesses. 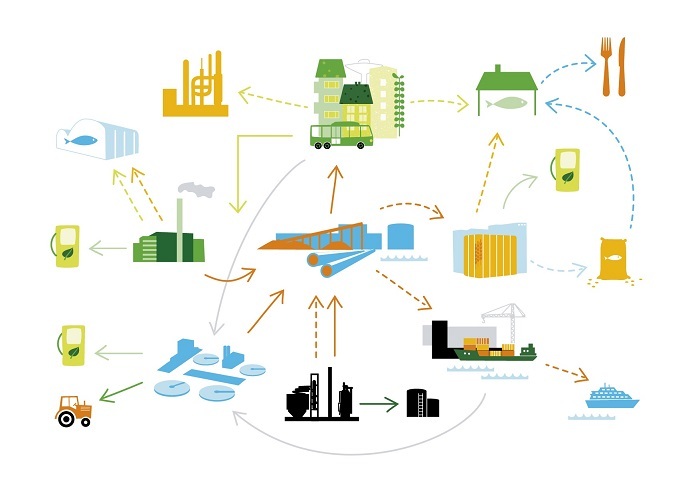 Many countries adapt industrial symbiosis as a way of creating circular solutions that create work opportunities, business attractiveness and sustainability. Urban and industrial symbiosis is therefore seen as an important tool to develop the harbour in a more sustainable direction. It is important to include both existing and new businesses in possible symbiosis scenarios. The starting point for Malmö was to map the flows that exist in the port today, in combination with dialogue and networking activities between key actors in the port. Developing the port area as a hub of industrial symbiosis is made through a triple helix collaboration between industry, city and academy. The project Shared Energy Doubles the Force has served as a platform for these collaborations and facilitated seminars, study visits, student projects, mapping, reports, breakfast meetings, investments, tests, conferences and hard work. This has led us to broaden the knowledge of industrial symbiosis and enable new working methods and Technologies. Shared energy doubles the force seeks to apply the concept of industrial symbiosis as a working method for city planning and business development in a big scale. We see the potential in developing and implementing of circle solutions within the industry in order to contribute to future attractive and sustainable cities. We intend to use already existing know ledge and networks for inclusion of further residual flows in the city, but also continue the process of creating a model for resource efficient and circular economy that can be scalable in other regions and countries. The project is going to include several residual flows in the city, such as energy, waste and waste water. Shared energy is going to develop, test, evaluate and invest in new working methods, Tools for planning and marketing, a market place for local energy sharing, resource plans and declarations by symbiotic cooperation between innovative partners within and outside the project. It is our intention to work towards sustainable industrial development in order to create synergies between industries and activities, preserve resources, increase the economic growth and social values. We will strive for advancing of circular flows and waste reduction as well as improvement of the recycling level and the purity of waste flows. Important parts of the project has been to map opportunities for the underutilized resource flows, identify joint solutions to our challenges, models for cooperation and to develop key actors’ future roles. In this work a new vision for the port has been created, which states our ambitions towards a more bio-based and circular port 2040. “In Malmö Port We Share – enhanced competitiveness through industrial symbiosis”. 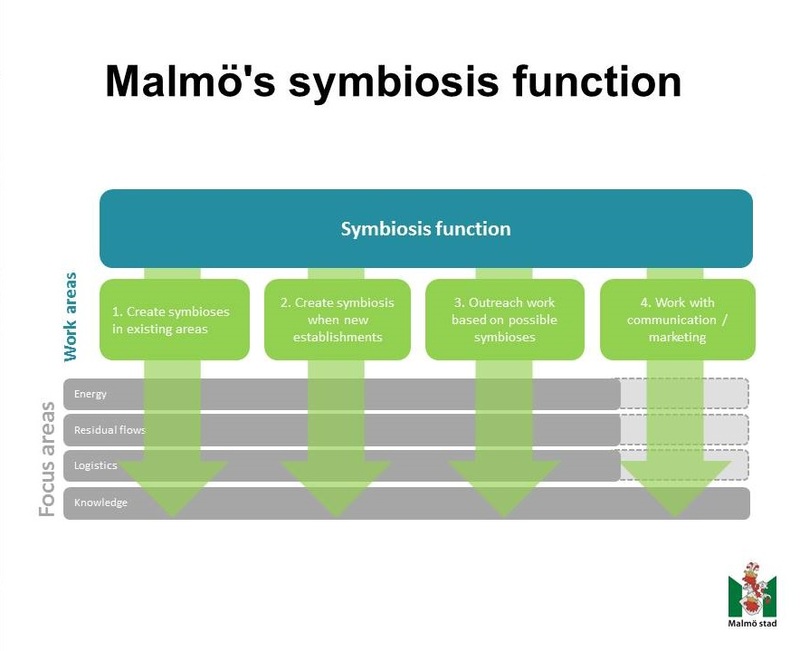 This vision will be implemented with the help of the newly established Symbiosis Function that will market Malmö as the site for Urban and Industrial Symbiosis. The City of Malmö has already started up the work to make it possible to integrate industrial symbiosis when planning new areas in the city. 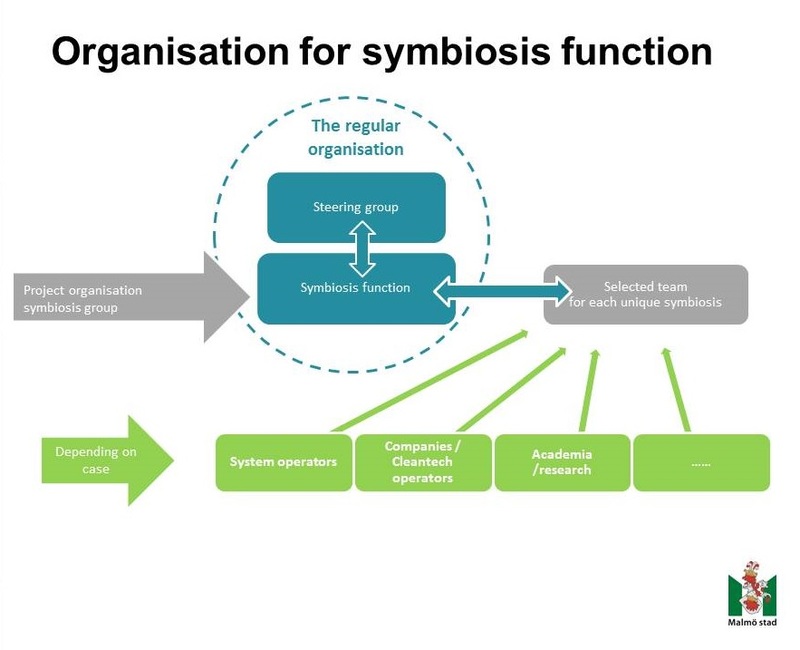 The aim is to create a symbiosis function within the organization of the City of Malmö. This function will be interdepartmental and will work to assist companies in the process of making symbiosis connections. The function will promote the establishment of symbiosis between businesses – city and business – business through city planning, dialogue with system operators, business development and marketing. In Malmö we already have minor symbioses in place: Residual heat delivered to the district heating network, waste is treated in different facilities and becomes useful resources such as new materials, biogas and bio fertilizers. During 2017 investments in heat pumps at Sjölunda Sewage Treatment Plant will allow large amounts of residual heat to be captured and used as district heating.